Exactly how nutritious are almonds you ask? Despite there blunders, almonds stand out with their amount of protein, fiber, niacin, riboflavin, vitamin e, potassium, copper, and manganese. In retrospect, our friendly nuts are a great source of increased metabolism, antioxidants, and a track to a healthier you. These fellows are also high in healthy essential oils. As for example, they contain 49% of these oils: 62% is oleic acid (omega-9 fatty acid), 24% is linoleic acid ( polyunsaturated omega-6 essential fatty acid). What Oleic acids do is they help keep balance with omega-3 oils and also are a necessity since the human body is unable to produce it. Along with Oleic acids, Linoleic acids can help reduce the risk of cardiovascular disease and stroke. These nuts can work like the contrary of trans fats, despite being high in saturated fat. Almonds lower LDL(bad cholesterol) and increase HDL(good cholesterol). And if you're looking for smooth skin, almonds are known for its emollients, which softens the skin. If you were wondering, the almonds became known to symbolize children, happiness, romance, good health, and fortune all from "bonboniares" which are sugared almonds wrapped in tulle as a wedding favor. Despite the Chinese's belief of almonds symbolizing eternal sadness...India has thought of almonds being good for the brain. India's superstition can be supported through an USATODAY article where scientists experimented with feeding mice with Alzheimer-related disease and conducting a memory test. The lab results were positive: mice with almonds did better than the mice without the nuts. Summing it all up, these all add onto the list of why you should eat almonds: To grow skinnier, reduce risks of health diseases, or get smarter. But that's not all, almonds are enjoyed in many ways. For example, Japanese adolescents enjoy almonds with sardines. 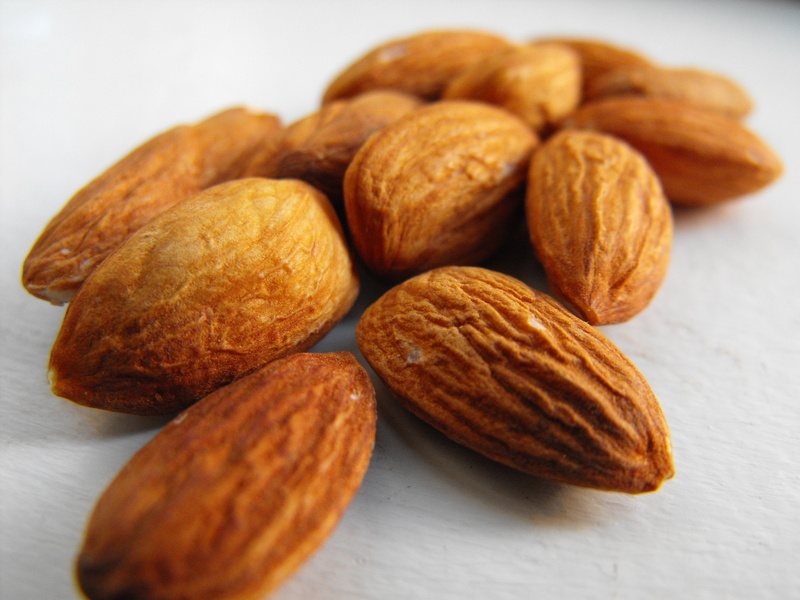 But other than that, almonds are commonly roasted, eaten raw, in trail mixes, in desserts, and almost anything else. Along with how to eat the almonds, there are concoctions such as almond milk which hold more health benefits than just the nuts. If you just can't stand the taste of them or anything which doesn't taste really good, then try some tasty recipes and/or "amande" desserts. Throughout all the methods of how almonds are to be eaten, I ultimately recommend eating are raw, unsalted ones. They may sound bland but they are far from it, they taste sweet when you chew them and the crunchiness is reputable.